Joe Portillo says this year for the city of Presidio has been very difficult. Aging infrastructure has been a problem, the city has not been competent at doing its best for quite some time. He asks for the County’s support. Mark Pearson- works with a group that is assisting on the Candelaria water system project. Candelaria has been on the EPA watch list for many years. Naturally occurring arsenic in water. TCEQ as well has been aware and has been patient. 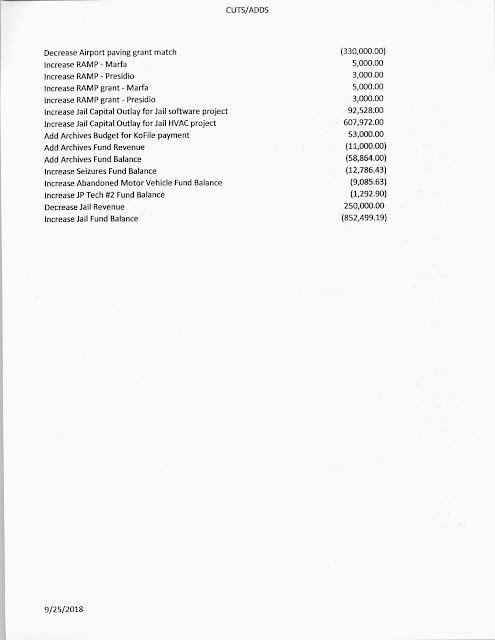 TWDB grants available and has been waiting on a stable board to develop before going forward. $300,000 available and it is the table again. Good news is that board is now formed and two meetings have been convened with full quorums. Conference call on Friday at 2:30 to move forward. Barbara Baskin thanks commissioners for Ruben Carrasco re,ovine Cottonwood trees that had fallen into the arroyo. Does not know what is going on with the OMB but she was happy about its formation back when it was formed. Her understanding was that it would take care of grants and administration of them. Requests that commissioners have Ruben Carrasco organize his files and make them available to the public at the courthouse. Records missing, one million dollars has been spent in Redford since 2013 and the main outcome has been the destruction of ten min irrigation system which had been functioning since the 1800s. State inspector came out last month to check it out and said it should be put back to where it was originally. Advocates for term limits for County Commissioners and review nepotism laws for the County. 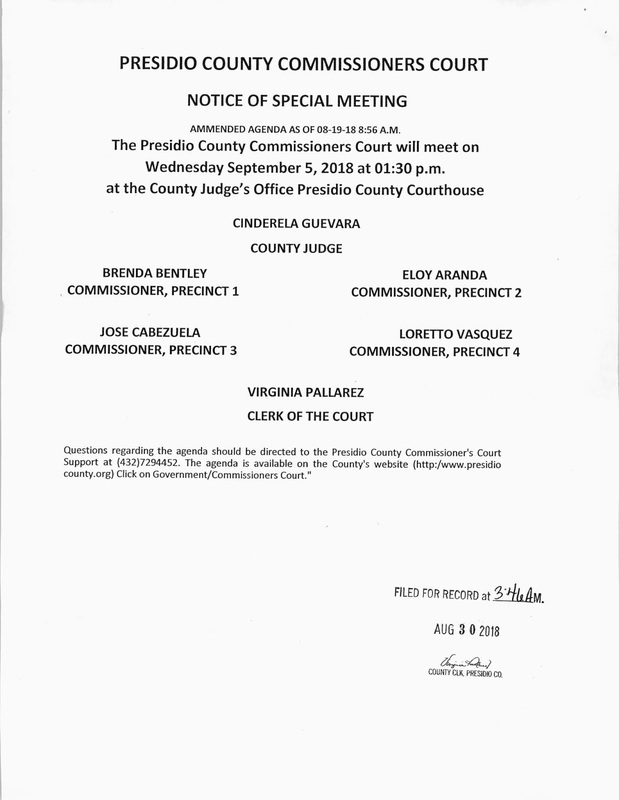 Introduces new judge assistant- Christian Montoya, resident of Presidio. Will use old County Atty office in Annex two days per week. He is a veteran, and also a reserve deputy with Sheriffs office. Aranda says he supports regular meetings in Presidio of commissioners court. 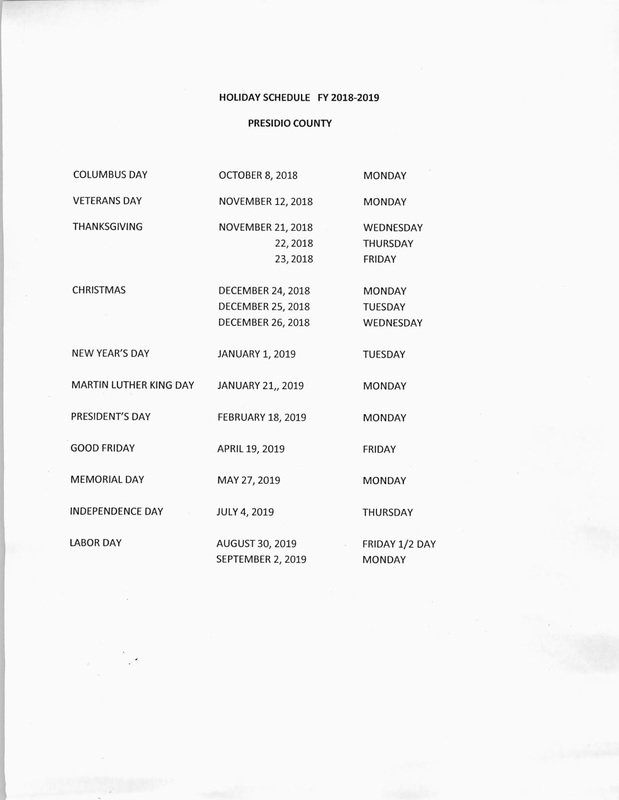 Have at least two meetings per month and have special meetings in Presidio. County Atty Ponton says 75% of population is in Presidio. Says it’s a great idea. Judge says in the past four years there has been at least one meeting per month in Presidio. 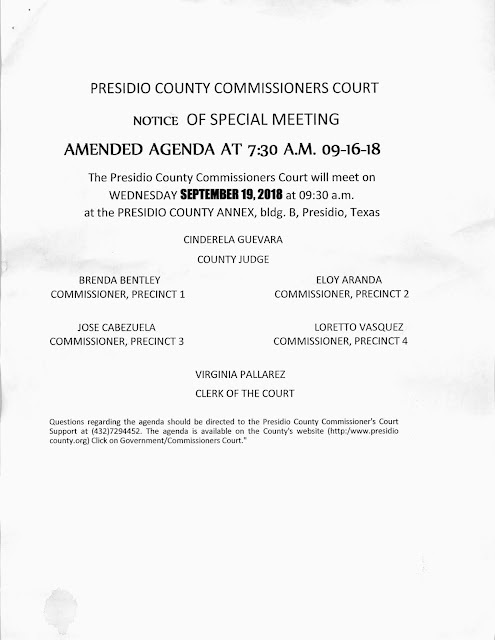 Judge says she would like to have more meetings in Presidio. Agenda item for next week. Sam Cobos and judge wrapped up solid waste grant application with COG. Applying for a trailer to pick up trash in Shafter at least once per month. Went to town hall at Dairy Queen with Will Hurd last weekend. Giant crowd, few county officials. Tough questions on immigration, he did a good job. Will be back on Oct 22 for groundbreaking of the railroad bridge. Big event. 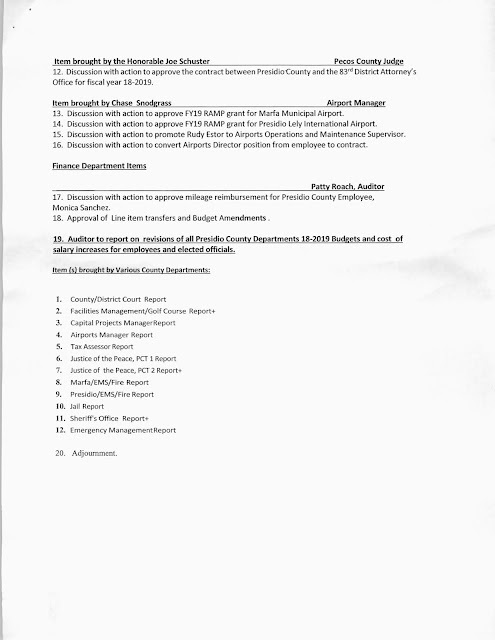 Says that Doak Painter, external auditor, and he will not audit county after this year. Judge asked why. Says he feels like the County is moving backwards. Says we can a long way but progress has stalled and training new people to administer grants is a big minus. Told judge to budget at least $60,000 to $80,000 in the future for an external auditor. He was doing it for $35,000. Opposed doing away with the OMB department. He is not the only person who was dejected by the dissolving of OMB and losing Katie Sanchez as part of the financial team. Judge says magnitude of that decision will continue to unfold over time. Aranda says he is sorry to hear about the auditor leaving. He helped us immensely. It had been a big mess. Says constituents told him and other commissioners they wanted less overhead, less admin. 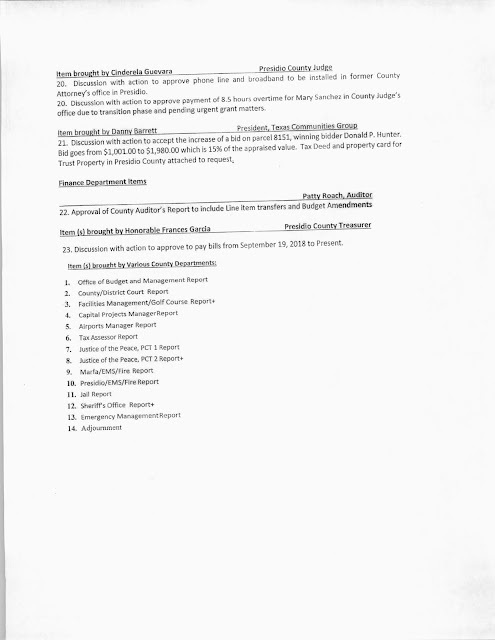 County auditor says that she has not been able to access the grant information yet. It is being withheld from her, she is trying to get records from grant distributors. She needs permission to get the files from the former OMB Dept. Frances Garcia says she as not been able to receive anything. Records are in Judge’s office. Judge says she has been busy and out of town. Says she will accommodate them when she has time. She is not ignoring the auditor or treasurer. She has had no help, says this is not deliberate. Vasquez asks if they will eventually have access to the information 24 hours. Yes, judge says. Aranda says he has nothing against Katie but the rumors are flying. Says he thinks that having Patty Roach as internal auditor has been fantastic and that every County official has done a great job in getting us to a better place. He does not like rumors and lies, people should not be telling commissioners what to do, and we are supposed t e one big family. Cabezuela agrees. Aranda is riled up. This must work out. All counties make changes and continue working. He is hearing a lot of talk and is tired of it. He commends everyone for doing great work, we can get this done. Judge says she agrees, she doesn’t complain that she doesn’t have help, has to get things done on her own. She agrees that commissioner s court makes the decisions, they are ours alone. Judge asks treasurer if there’s anything unique about payroll. Frances Garcia says no. Total is just over $93,000. Approve minutes of meetings Aug 17, 22, Sept 8. Item 8: discussion and approval of jail exhaust fan replacement change order. Judge says we need a new ladder to get to roof. Parker Weimers, jail maintenance director, presents. Refrigerated air has been installed, replacing evaporative cooling. Refrigerated air is much better for preserving computer systems. Current exhaust fans installed in 1993. Draw evaporative cooling air out. 28 exhaust fans. New technology would be half of those, high speed only to evacuate smoke in case of fire. Old fans are in bad shape, have been band aided and replacement parts have to be custom made. 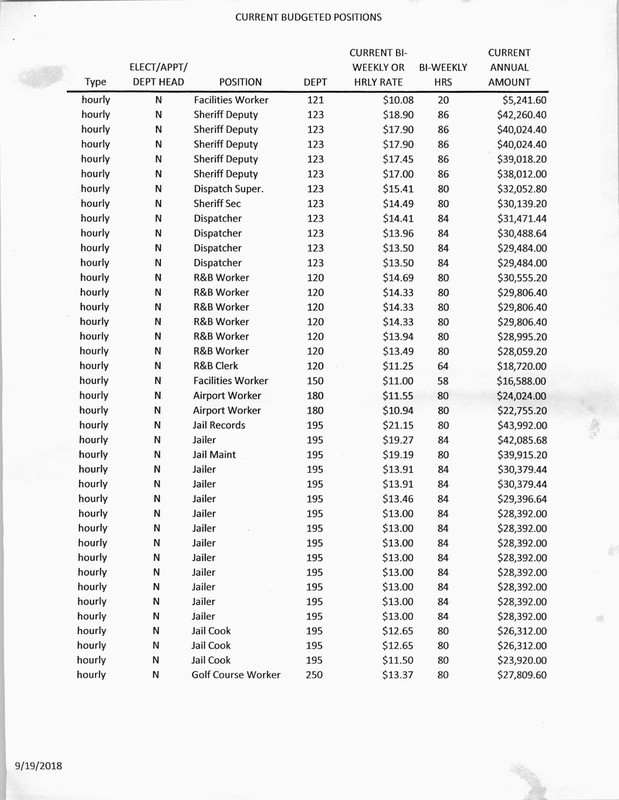 County has liability of caring for safety of inmates and employees. Fans outline perimeter of jail plus in center. Newer technology can be designed to match new HVAC system. Aranda wants to know what the change order would be. Parker says 14 new fans installed to do the job is about $112,000. 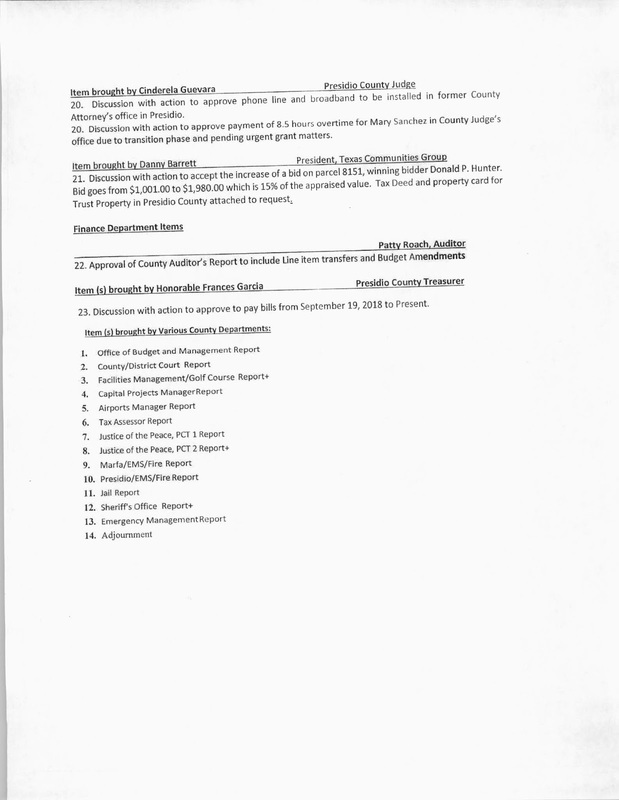 County Atty left meeting, was supposed to have spoken to contractor about this job, was it in contract? Judge says the contact does not say that fans would be replaced, only that existing fans would be made to work with new system. Contractor says he is willing to work with us, but the old stuff may only function for a few months. Has new bid for new equipment with warranty. Sheriff is asking for replacement with new equipment. Judge understands that the contract has been controversial. We need to be able to reopen to federal prisoners. 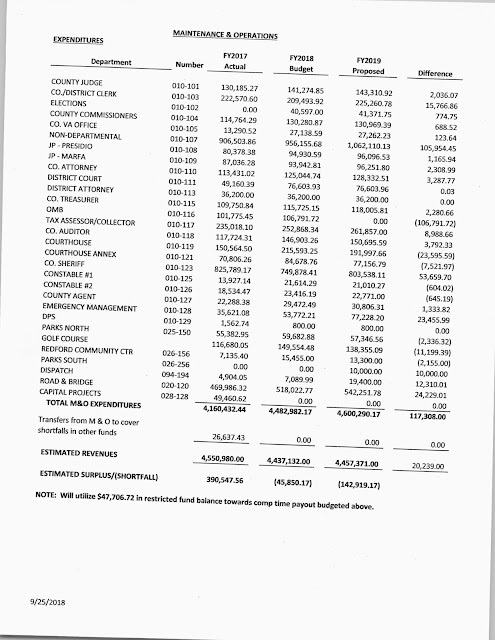 County has already lost $300,000 in revenue. We need to get this done before we lose more. Aranda agrees. Lots of money, though and contract should be abided by. Upset about the contract issues. It’s easy for us to say that we can just spend the money, but before we make a decision we need to talk to County Atty about what he discussed with the contractor. Contractor is insured, bonded. If there is a breach of contract it’s insured. Parker says facilities manager Sam Cobos has been making decisions and has never been on the roof. Vasquez says he agrees we have to get this done, wants to hear what Rod has to say. Sheriff says he understands the contract issues. The reality is we need to get this done, we can go after the contractor later. This has been postponed three times already, this is going to set us back further. Judge says she will take a break and call Rod Ponton. 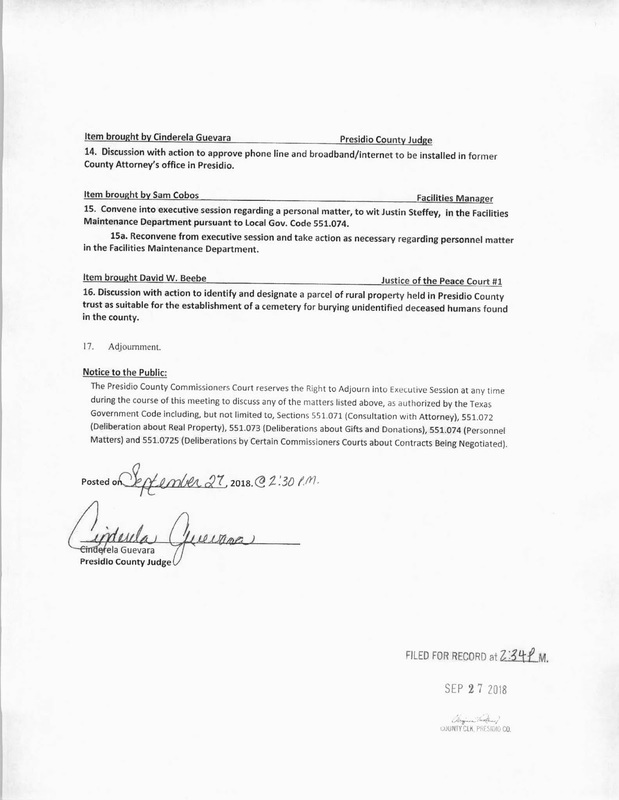 Judge says that Alfredo Mediano warned her about connecting old to new equipment, it doesn’t work out usually. Judge also says that Sam Cobos told the contractor in an email that county staff would be sure everything was working before the AC units were to be installed . Sometimes things change, contracts have to resilient. Gary Mitschke says that smoke inhalation is a much bigger killer than fire. Combustibles in jail are limited but what is combustible, eg mattresses, can kill quickly. This is very important. Exhausting air in a fire is critical. Commissioners look at more slides and the will break to call Ponton. Judge Beebe tells commissioners that the jail is the County’s cash register, commissioner Aranda remembers when the jail was closed and what that did to the County. Everything in the jail should be working properly and up to date. The main panel should be replaced immediately, the locks do not work, the exhaust fans are a no brainer. This should be a top priority and should be done without any delay. Judge calls Ponton on speaker. No answer and voice mail is full. Calls contractor Jay (unknown) about contract and exhaust fans. Contractor confirms that contract specified old exhaust fans would be used. Says his guys are there right now and can do some monies work on existing fans if needed, but replacement was never part of the contract. Says it’s possible that existing fans could work, he will know by the end of the week if that’s possible. Judge says that she will be in touch. 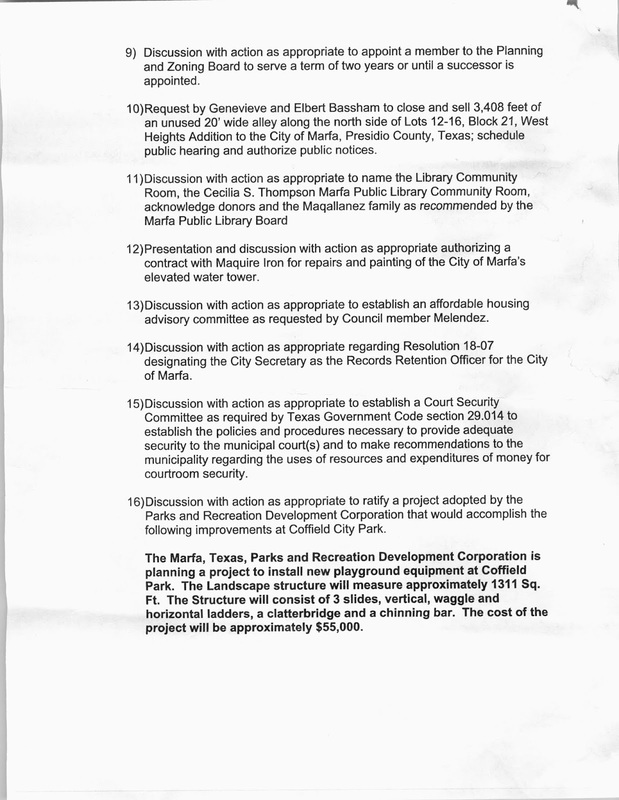 Aranda asks about timeline for finishing project. Jay says by the end of next week barring problems. If new fans need to be installed it may add a couple of weeks to the job. Aranda says he thinks we need to move forward and get this jail set up for next 25 years. 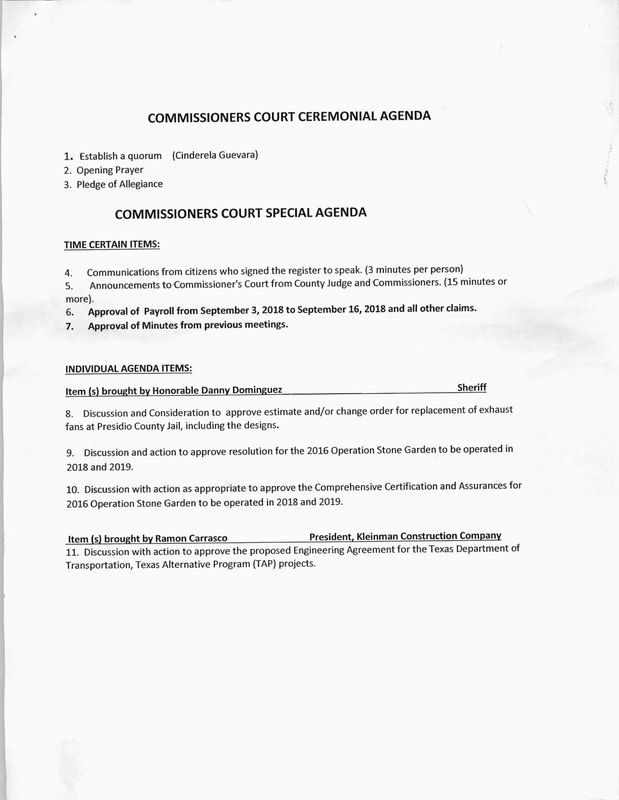 Vasquez motions to approve change order and replace fans. Before vote Judge wants to review scope of work. Asks Sheriff is he agrees with scope of work of change order. Judge reads order. Sheriff is ok with this. Aranda is ok with this. 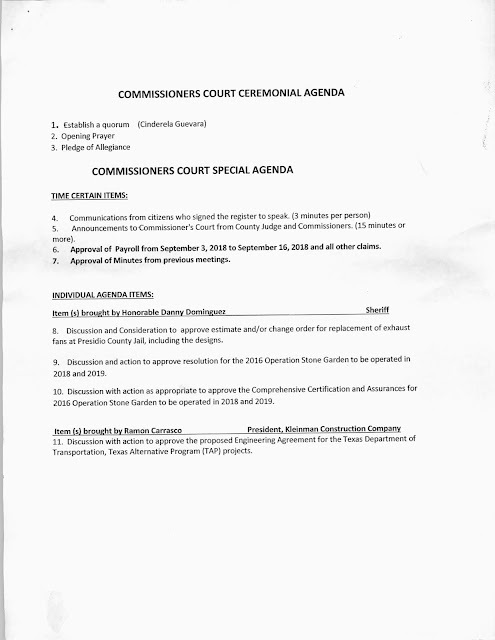 Item 9: approve Operation Stonegarden 2016 resolution to be operated in 2018 and 2019. Applicable matching funds if rules are not followed. To be returned to office of the Governor. Judge asks Sheriff I we are ready to go on Stonegarden. Katie Sanchez says that she needs a few forms for IRS and direct deposit. Still in application process for that but nearly ready to go. Patty Roach says that transition of grants from OMB to auditor and treasurer has not happened smoothly and this is one of the issues. Sheriff says in other words the two of y’all need to get together. Judge says she will not sign anything unless she gets every email from every person. This means everything from everyone. Aranda wants to get this transition done, commissioners court decided this and this should be done immediately. Let’s get this going. Judge motions to approve the resolution. Approve assurances for Operation Stonegarden. Sheriffs Dept and Katie Sanchez explain that assurances are part of requirements for grant. Engineering agreement for TXDOT TAPS grant project. Ramon Carrasco of Kleinman construction presents. 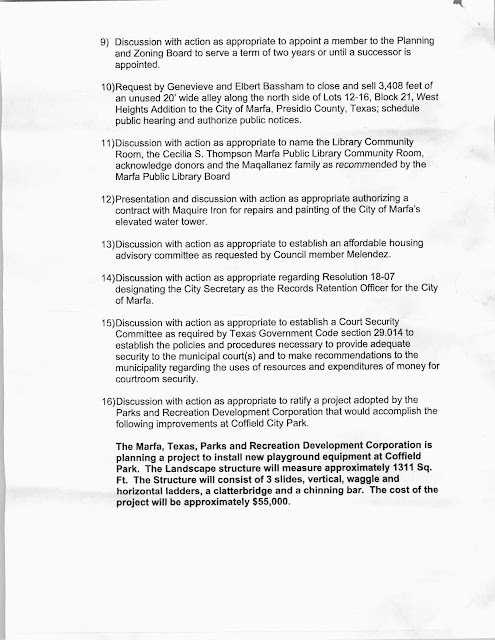 City of Presidio is involved in this process, can’t pay the entire match for this project. Kleinman has worked with them in pricing, and will give same discounts to County. Six months to finish design, as per TXDOT. Going out for bids in June. Aranda mentions there were some questions as to how contracts were awarded. Judge consulted with Allison and Bass law firm. TXDOT in El Paso said that since Spencer bid was lower we should go with them. 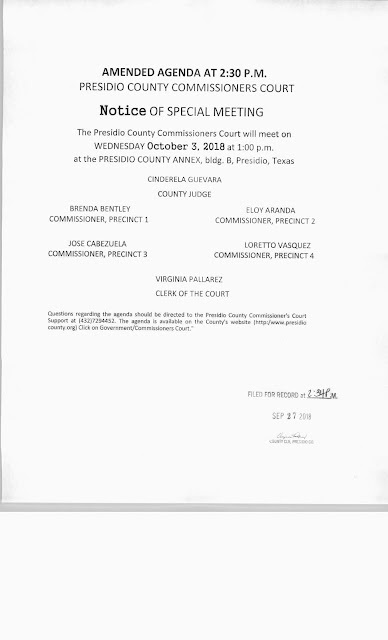 AG opinion says that commissioners court has the authority to name who they want. 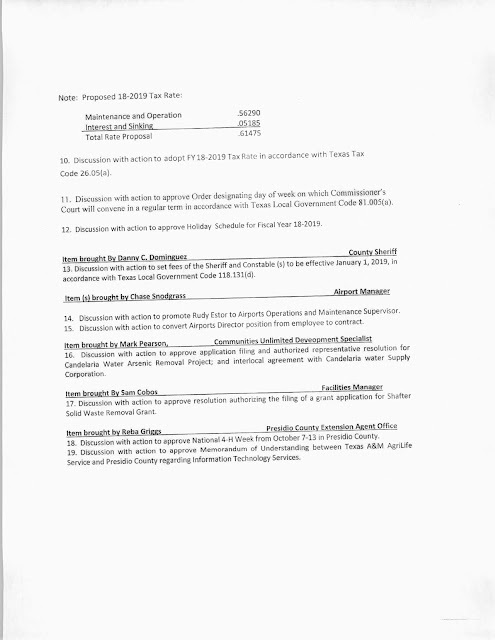 TXDOT legal then reviewed and said we could stick with Kleinman but if audited would have to answer as to why. Ramon says RFQ for future work on this project should be issued to stay above board in TXDOTs eyes. 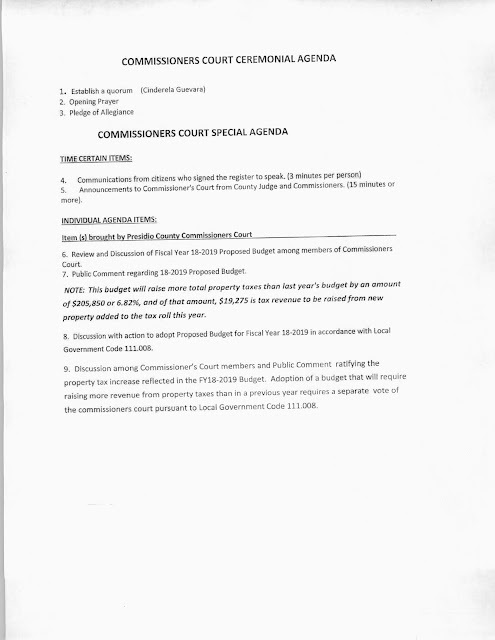 Item 12: agreement between County and 83rd District Atty office. Nothing changes from last year to this year. County Atty looked this over and said it was ok. Item 13-16 Airports items brought by Chase Snodgrass. 50% match. $50,000 for each airport. 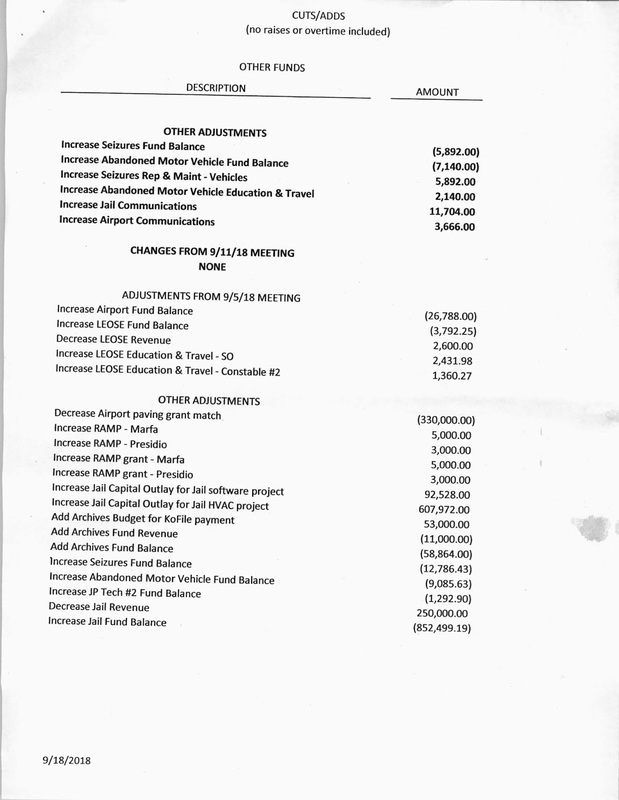 Up to $100,000 per airport possible to spend. 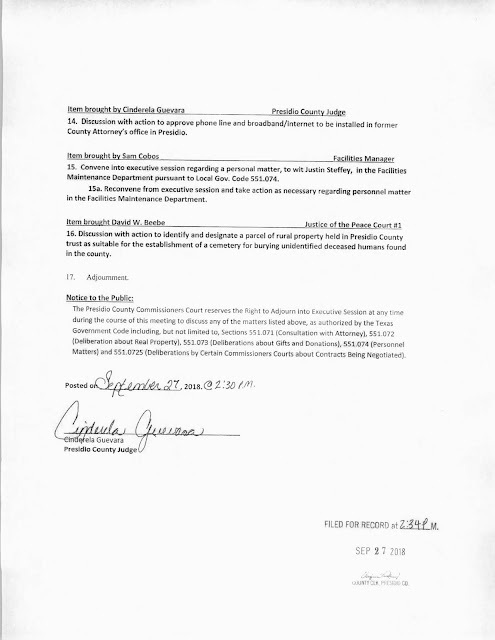 Needs County Atty and judge’s signatures. Chase updates commissioners on Omnibus grants funding. Says it’s a moving target. 100 percent grant if we get it, we have been pulling out the stops. A month ago Greg Miller from TXDOT says there’s only seven airports in Texas eligible. Was supposed to have info by Sept 1. Possible info by this Friday. FAA decision. 5.7 million. Pavement would be added to make seven inches of pavement. Dan Williams company from El Paso has bid, only bidder. 4.6 million bid. Under max. Feds have not yet elevated the money, if they release we have the full funding. Judge is worried we may not receive grant. 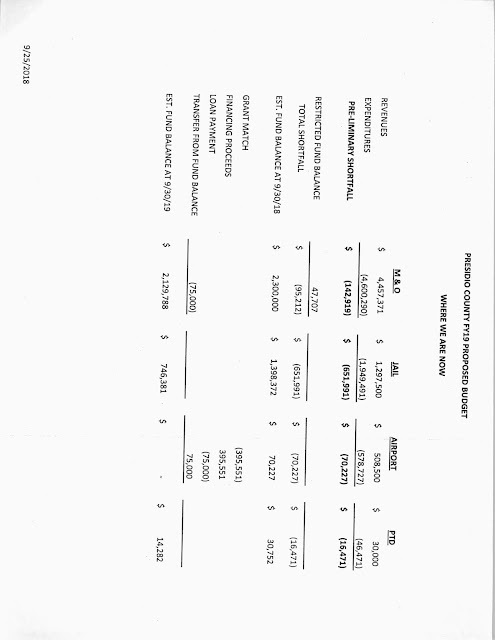 Co7nty is still on the books for the regular, preceding 3.3 million dollars for runway improvements. Will have to bid if not awarded before Nov 11. Hangar leases still not ironed out. Could be part of an issue. Chase says the air traffic control system that has been in place for decades has been a combination of radar and communication by radio. Too much radio traffic in big airports. Becoming unworkable for the FAA. NextGen is coming. New equipment required for all small planes, kind of pricey for small operators. Text messaging to screen for pilots. Identified that they want to put equipment that runs this system locally into the Marfa airport and are willing to pay a monthly lease for space at the airport. Site survey for where to put that equipment happening today, he needs to get back to Marfa. Judge has to take a phone call. Two minute break at 12:10 pm. 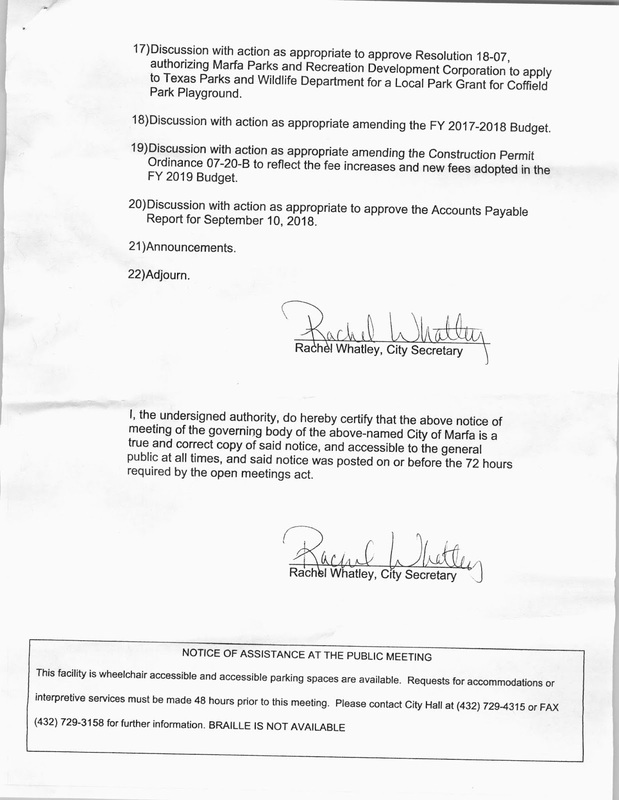 Vasquez motion to approve the RAMP grants for Presidio airport. Promote Rudy Ester to Airports Operations and Maintenance Supervisor. Chase advocates for Rudy, who is here at the meeting. Chase says he himself was filling that role without any additional pay. 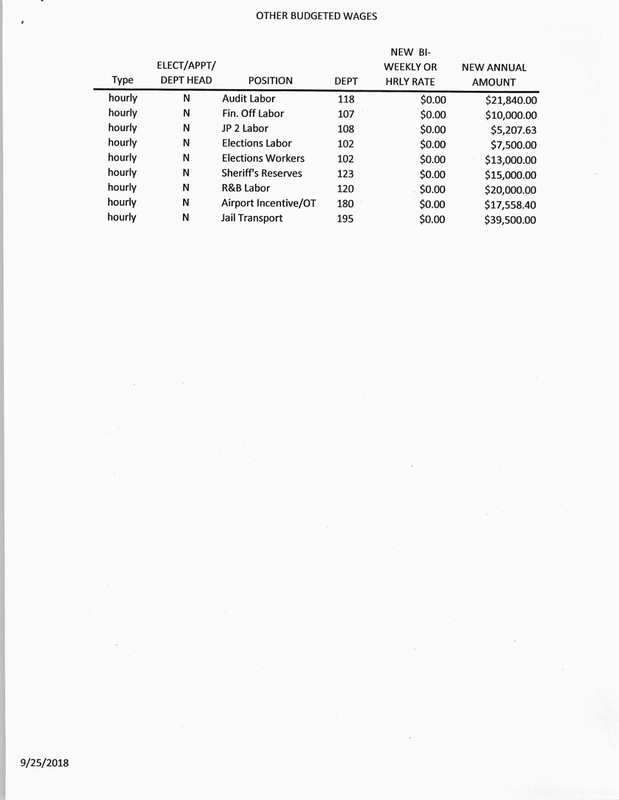 Proposed $16.50 per hour with reduction in pay for Chase commensurate to Rudy’s raise. Judge says she agrees but is concerned about the relation between this item and the next item switching Chase from employee to contract labor. Chase says he sent his proposal by email yesterday. Judge says that she feels like the changes Chase is asking for can wait until after we have had time to really study the contract and possibly come up with a counter proposal. She says she is not opposed to changing things, but she thinks they should not rush this and really decide what the County wants to do for the future. These two employment situations are interrelated. Chase explains what Rudy would do when asked by Aranda. Basically manage airport operations. Vasquez asks how this all works on weekends. Chase says that Rudy works weekend and usually takes Tuesdays and Wednesdays off. Says Rudy does not take any holidays off. Does not get paid double time on holidays. They charge the aircraft owners a fifty dollar overtime fee for after hours service. Rudy would oversee both airports. Currently comes to Presidio airport every Monday. Uses City of Presidio vehicle when he is here. Airport provides vehicle to get to Presidio in the courtesy car. Vasquez would like to postpone this item for further study. Chase says he understands the sentiment to not rush this issue. Aranda says the budget negotiations are the right time to deal with this. County Atty needs to review as well. Next week’s meeting. Aranda commends Rudy for his dedication, the airport’s staff is doing a great job. Rudy says he really likes his job. 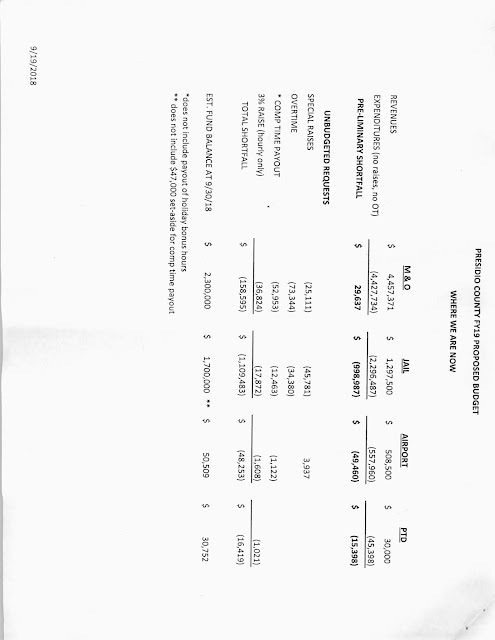 Auditor says this is one of the special raise requests and other departments. Have their own pending. Aranda says he would like to wait until next week to decide on all those, including this one. Auditor agrees. Says she reviewed contract and may need some review. Aranda wants to postpone. Aranda motions to postpone item 15. Unanimous. Judge makes motion to postpone item 16. Unanimous. Next Wednesday. Item 17: mileage reimbursement for dispatch employee Monica Sanchez. Approved it last week but additional twenty miles not reimbursed. Extra mileage to get to and from hotels and school. Sheriff provides information. 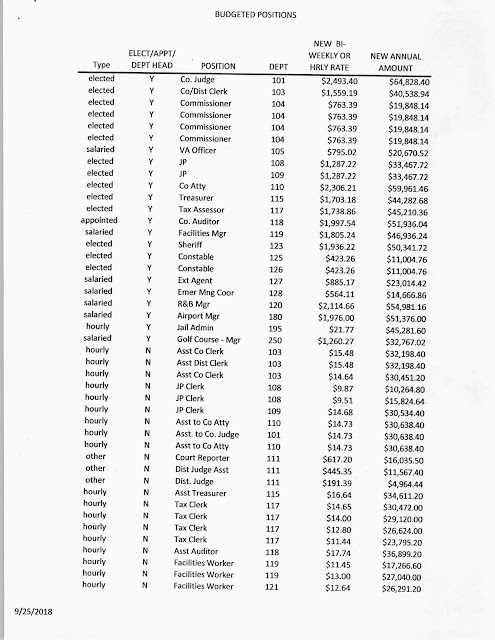 Clerks office assistant Florcita wages out of elections fund. Back to item 6: bills not yet approved. Information distributed by auditor to officials and attendees includes descriptions of changes made to budget in past meetings, current status, updated overview of expenses, comp time payouts to complete comp time and move to paying overtime. Comp time plus holiday time, if paid out now, would costs County approximately $100,000. Comp time for Sheriffs Office is approx $50,000. 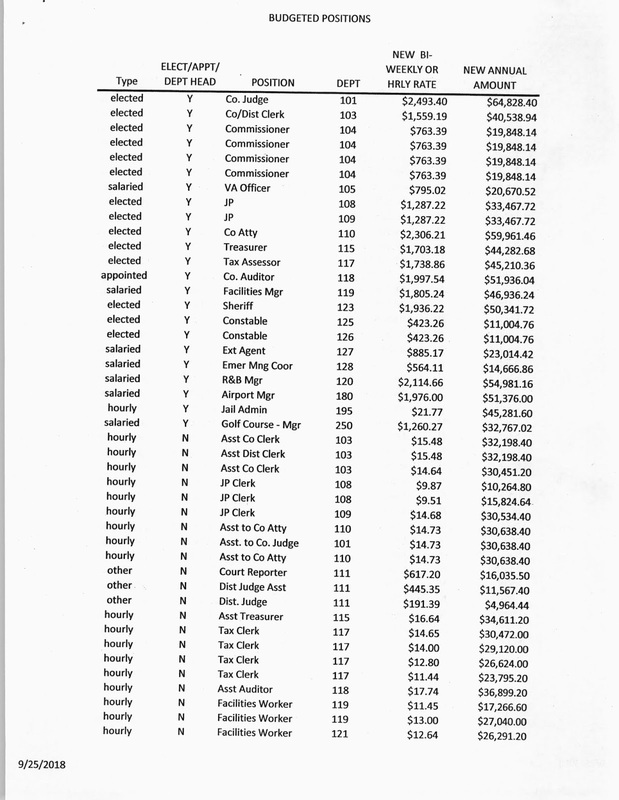 Jail is around $12,000. Jail HVAC bills may or may not come during this fiscal year. Aranda asks about special salary increase requests. 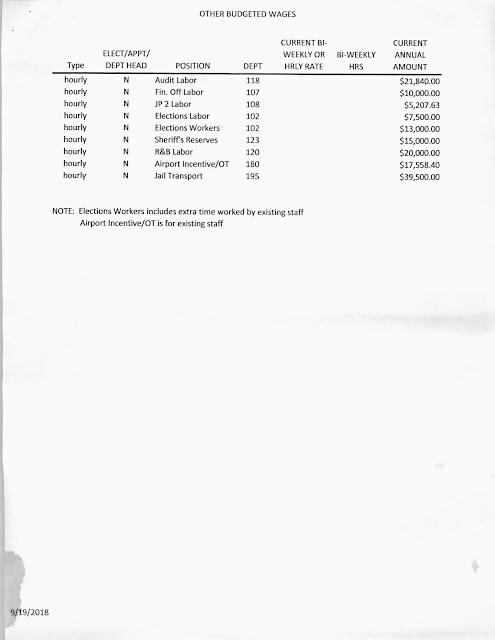 Will these employees get an increase and also a 3% increase? Auditor says commissioners have to decide. Aranda wants to make it clear that if they get a special raise there will not be a 3% on top of that. Possible Chuck Simpson since he is very underpaid. Talk about giving a flat rate raise instead of a percentage for employees. External auditor will cost about $60,000. Needs to be budgeted. Judge asks just why we treat the County enterprise fund as reserves instead of income. Says that it really hit hard during election year, constituents believe we are spending money we do not have. Auditor explains to commissioners that labels do not change the reality that you are spending money out of reserves. Auditor makes case for jail funds not being part of the general overall budget but as separate reserves that can legally be used to offset deficit budgets. Says that funding salaries, recurring expenses though reserve funds is not a good idea. Aranda says we are in better shape than before, we have been reducing the deficit, we have cash in the bank. Auditor agrees we are doing better but she really dislikes deficit budgets. Reserve funds should be used for special projects. Judge says we are gathering money but not lowering taxes. 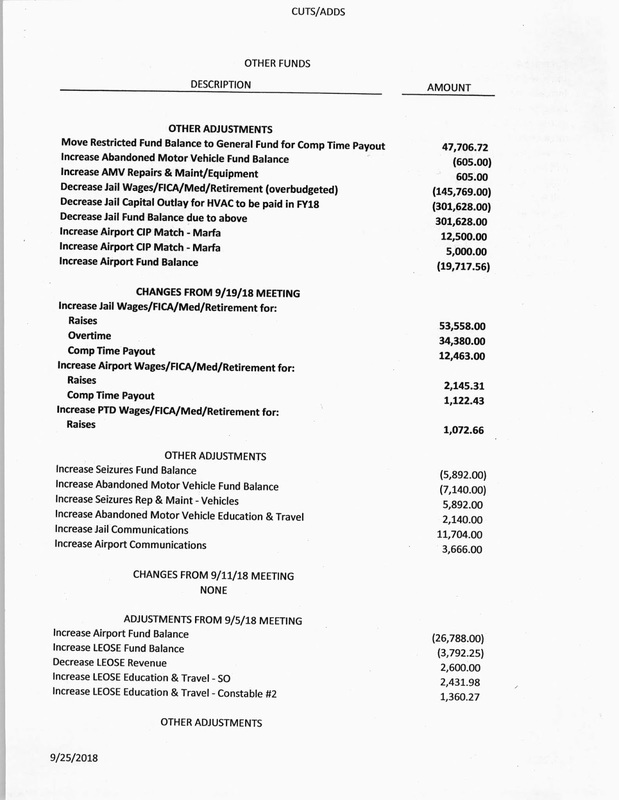 Auditor says we must have reserve monies on hand. Aranda agrees we must have monies in reserves and once we can approve a budget without a deficit we can lower the tax rate. Six months reserve funds wold be best for bond ratings. Single audit will be due for fiscal year 2019 in 2020. Presidio County Underground Water District. 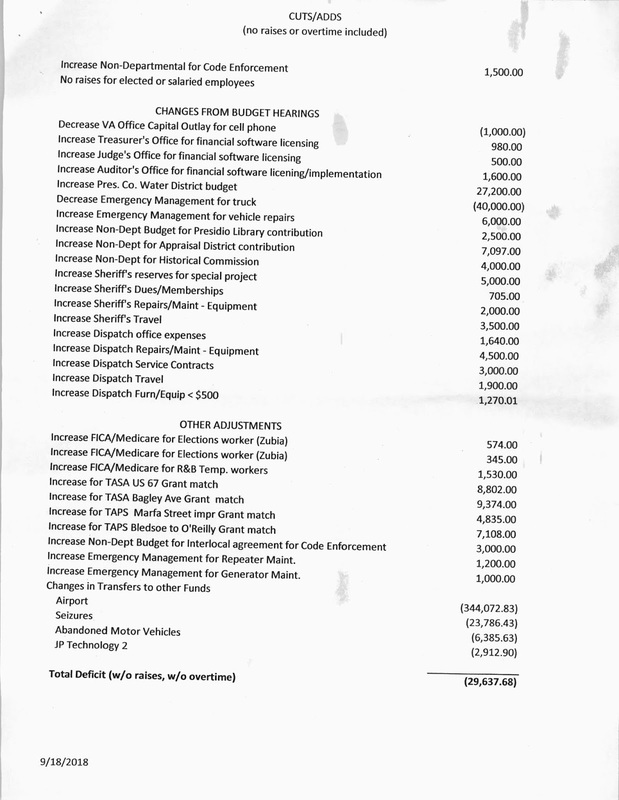 Judge cut the monitoring equipment in their budget. $10,000 reduction. $27,000 more than last year. 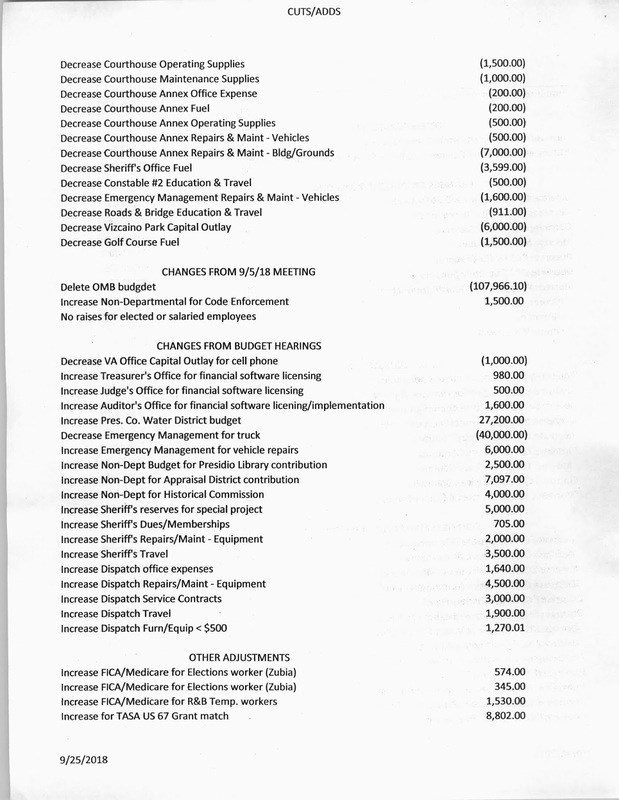 DPS budget. Asking for $3,000 in office expense and $3,000 in office supplies. Judge Beebe says that the commissioners don’t even give enough money to operate the county’s own offices, much less fund other offices. 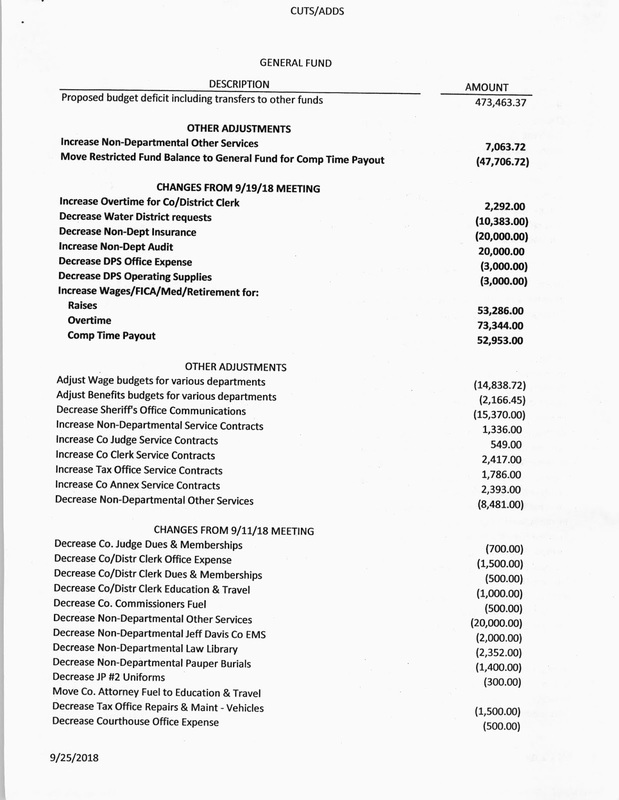 The DPS receives a billion dollars every two years for border security, now asking for County money to fund their office? Outside entities seem to get what they ask for while County offices aren’t allocated enough to get by. Judge says maybe we can give $1,500 and warn them there might not be any money next year. 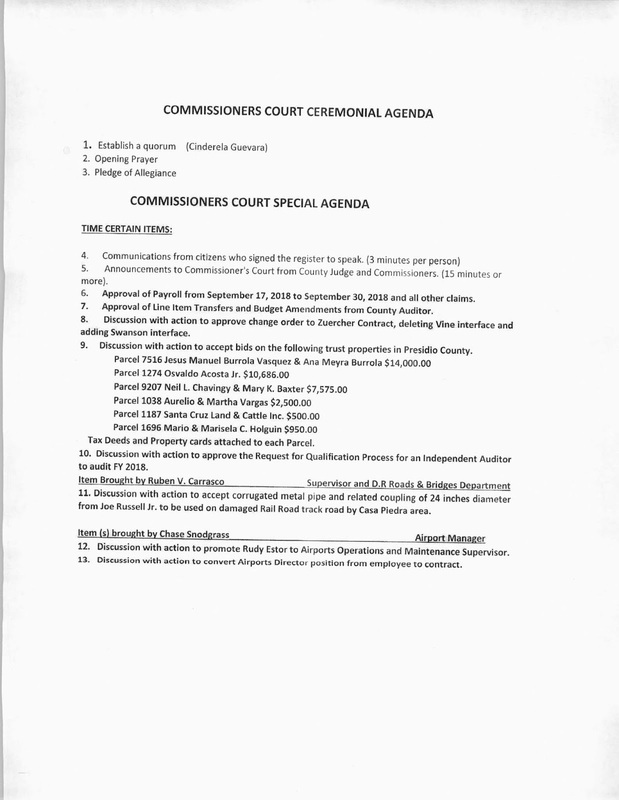 Commissioners say zero, just the $800 for phones, as has been done in the past. State offices should be funded by the State. Auditor discusses pipeline tax revenue and lack thereof of major increase in collections to County. 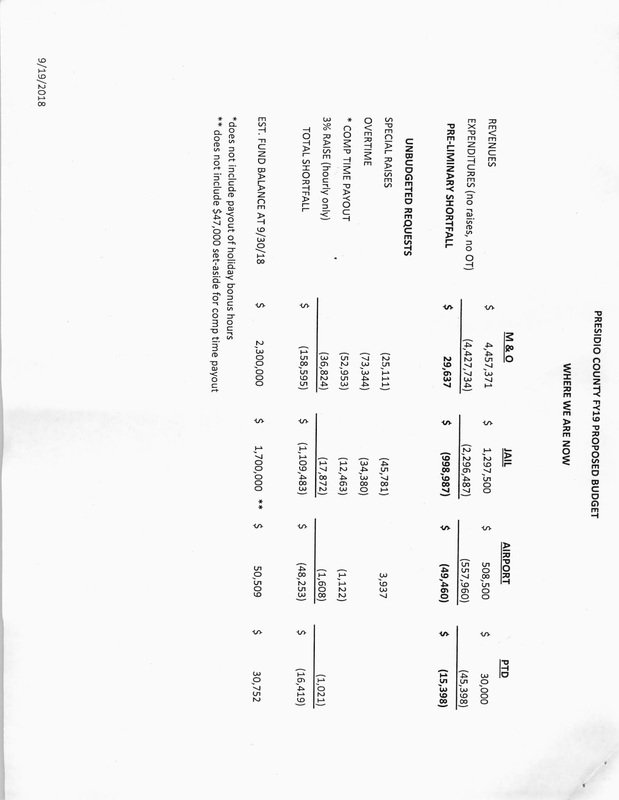 Presidio Public Library contribution went up by $2500 to $5000. Vasquez says he doesn’t like that the Appraisal District gets raises every year like clockwork. 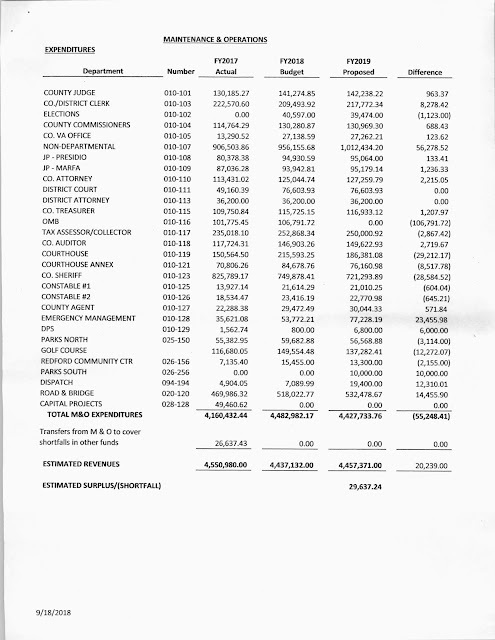 Feels bad that County e,polyester don’t always get them but that every year County gives Appraisal District more funds. Judge is interested in increases if salary increases and special raises are included. On sheet. 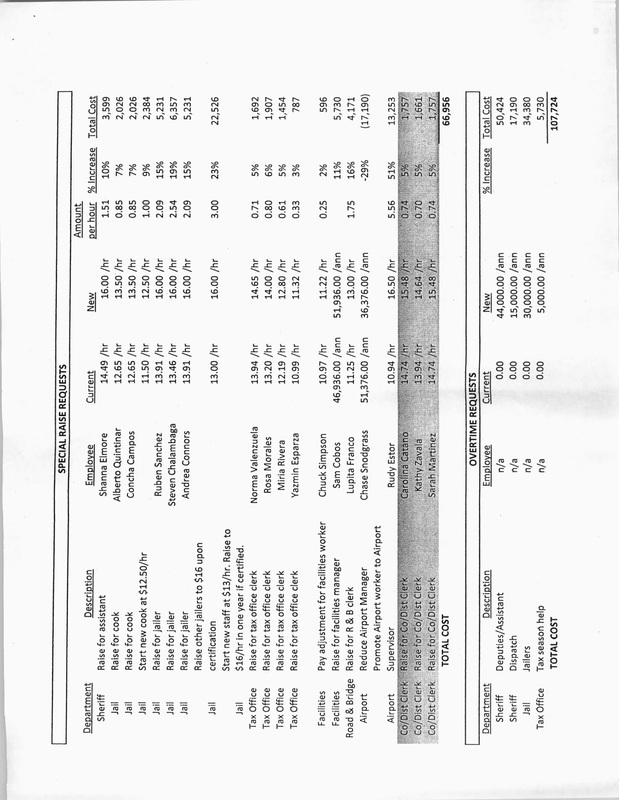 Auditor feels comfortable paying comp time payouts out of reserves since it’s non-recurring. 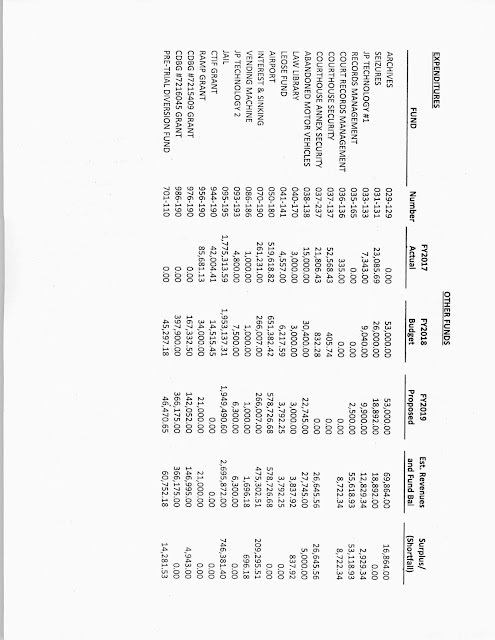 Auditor recommends county give a same per hour raise, not 3%. Possibly 45 cents per hour. More equitable for hours worked, full time employees. Sheriff asks if special raises would have across the board raises. No, say commissioners. Sheriff says he has already budgeted for raises out of his own budget. And if he has done that, they would be excluded from across the board raises only for this year, correct? Yes, just this budget cycle, say commissioners. Auditor advocates for special raise for Chuck Simpson and Jasmine on the tax office as their current wage rates are lower than some part time workers in the same Dept’s. Judge goes through special raise requests. 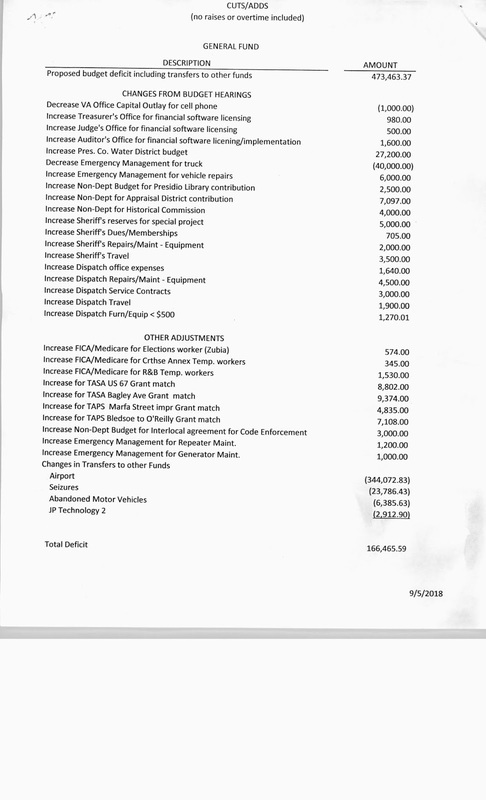 Shanna Elmore- sheriff gave up fuel budget for that request. Cooks - 14 hour shifts. Tax office, longevity type raises for clerks. 15, 18, and 3 years in succession on sheet. 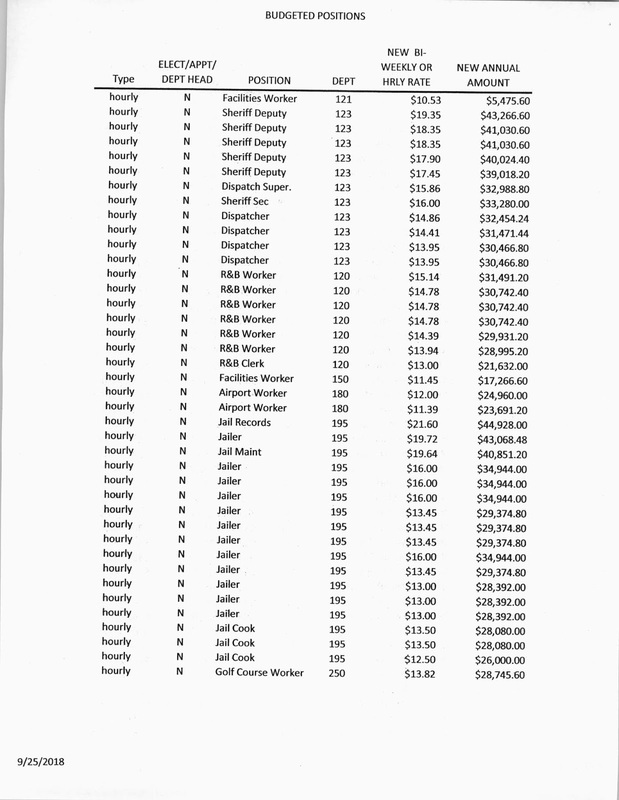 Chuck Simpson, judge would like to see him at $13/hr. Sam Cobos asked for raise. No, no raises for Dept heads. Road and bridge clerk Lupita Franco. Has been there seven years. Airport leases - still up in the air. Commissioners need to take action. Some discussion. Need it for grant requirements. Rudy Estor. Asking for $16.50, commissioners said $16 this morning. He gets bonus pay for fuel sale bonus. Also overtime paid by pilots in off hours. Talk about whether airport monies all have to stay within the airport funds. 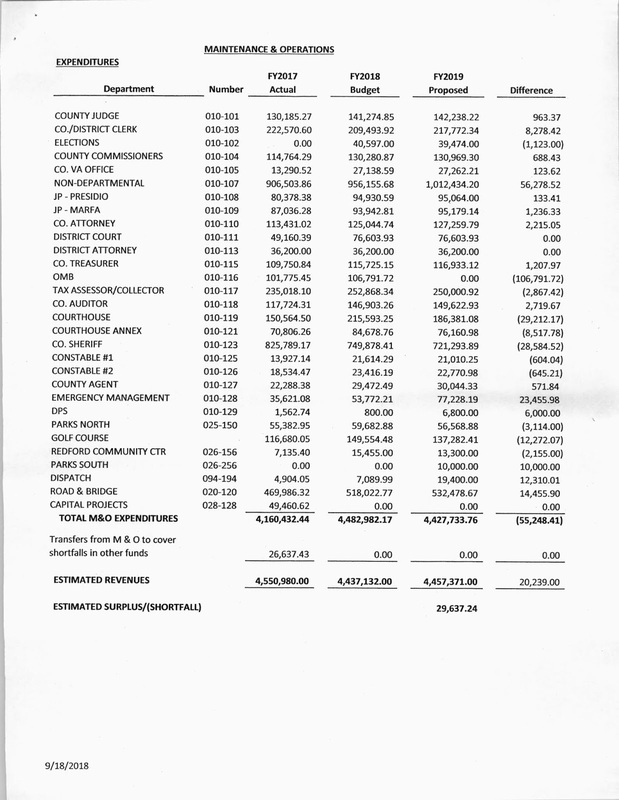 County Clerk is asking for 5% raises for her employees. All have been there more than five years. Judge is asking about clerk office end of the month reports still being outsourced with four employees in house and years of experience. 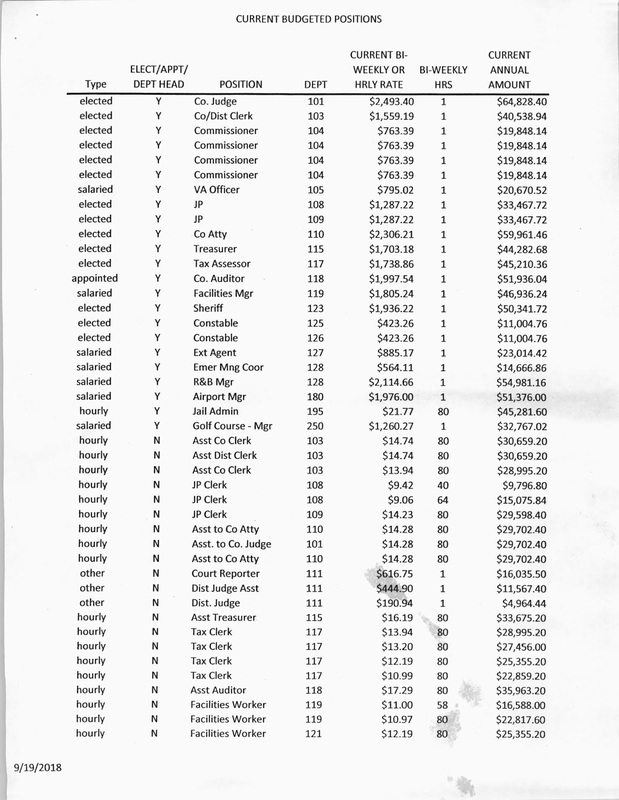 Clerk wants raises, judge wants to not outsource reports. Aranda says we’ll just leave it the way it is. Aranda says we are doing our best to keep everybody happy and not everyone is going to be happy. Auditor says that a salary schedule is something that really needs to happen. Judge says she will get each Dept head to do their own research. Auditor clarifies that all raises will be given except for Cobos and Rudy Estor will be at $16, Jazmin and Chuck will be raised up to a regular level. Judge wants to wait on the airports decisions until next meeting. So for now it’s decided that may change. One more jailer, Maria Sainz has been there a year in Oct and just received certifications. Judge wants to postpone reports until next week. 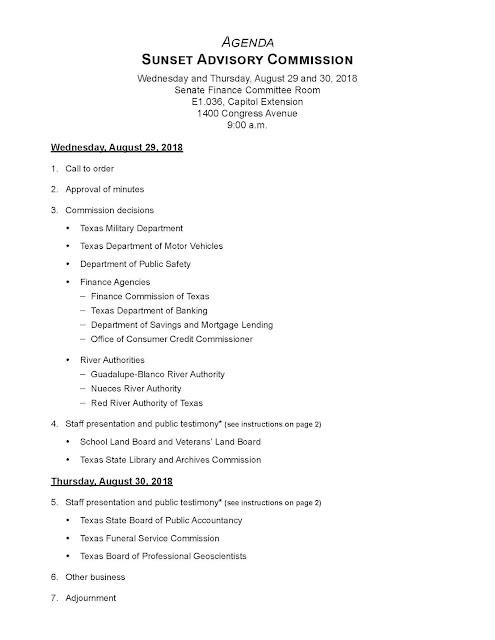 Notes from August 29th Texas Sunset Commission hearing regarding DPS license issuance office closures et al. I was in Austin for Texas Association of Counties Leadership and Legislative Session training and preparation the week of this hearing, and went to the Capitol to attend. Here are my notes. I stayed from the beginning until I had to leave. 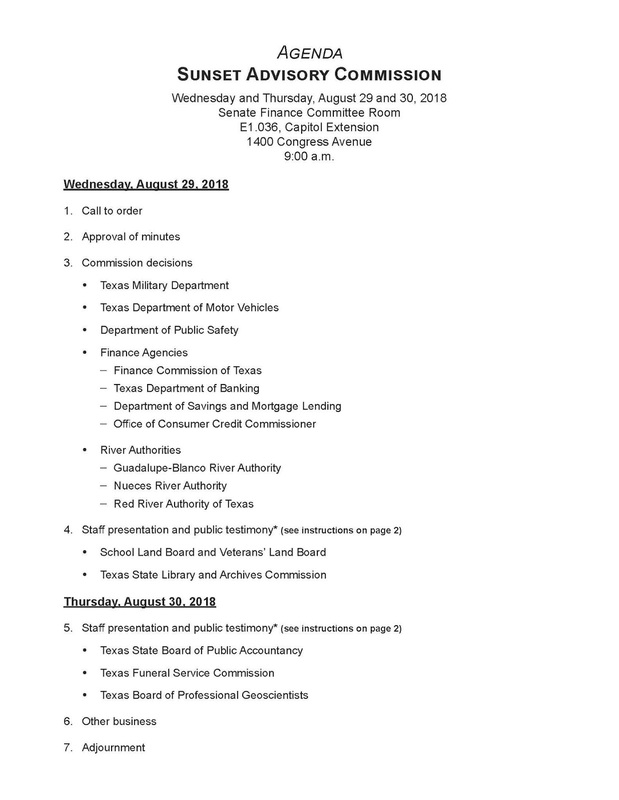 Notes on Sunset Commission Meeting, 9 AM, Wednesday August 29th, 2018. Texas Military Dept: no modifications or new issues proposed. Move to adopt the report by chair. Issues include too many industry members on board. Need outside public member. Chairman Birdwell abstains and says he has a modification. Says that topic of how regulatory boards are set up was discussed at length at last meeting. Requests that the Legislature as a whole address this issue for all agencies and boards. Omnibus bill. Board structure changes issues 1.2 would be addressed. 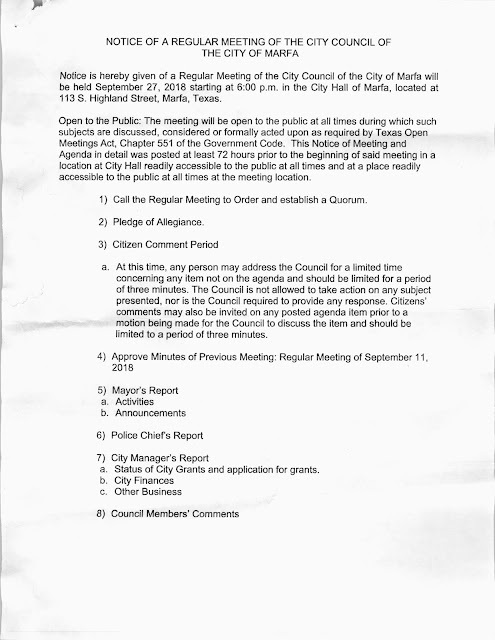 Motion for whole item will not include those issues. Unanimously approved. Kirk Watson has a modification to adopt his modification to1.4. Adopted unanimously. Issue 1.1 is adopted. Issue one as modified is adopted. Fraud warning systems for county tax assessors. Ability to suspend access to system. Pataki has modification. Instructs DMV to work with county tax assessors to create methods for identifying red flags. Thompson: training issues. Needs to be available online. Adopted. Issue 2.4 cooperation between dealers and tax assessors, agency for best practices sharing. 2.5 : ability for agency and tax assessors to audit dealers. Adopted. Issue 2 with modifications adopted. Motion n to remove 3.1 by Lambert. Second. Vote is split, mostly yes.Nevarez votes no. 3.1 is adopted. 6/5 1 abstention. Remainder of issue 3 to be voted on. General counsel for commission says 3.1 passes for now, but final vote must have majority of members voting, which is 7. Chairman says every vote must be a majority of the quorum. 6/5 vote means it does not count only on final passage. Motion for adoption of whole issue is key. Chair says 3.2 to 3.9 can be voted on without 3.1. No modification to overall, 3.1 would be included. Issue 4.2 modification to keep lease facilitator. Says that leases are confusing, dealers put this in twenty five years ago. Adopted. Rep Flynn moves against entire issue. Says that he does not like the changes. Issue 4.3-4.7 up for adoption. 3 yes, 8 nays, 1 abstention. Issue 5 as a whole, unmodified. Hall asks if we can change a date within a statute. Deadline was 2021, Paddie says he would like to see the 2018 date, which was originally signed by Texas State. Buckingham wants to ask DMV rep a question. No objection. DMV Rep: Whitney Brewster, executive Director. Is the date feasible? She says March 2019is feasible. California has a pilot program. Fleet vehicles, electronic plates. Loss of revenue to State? Study will address this. Paddie says that his modification addresses timeliness. Why such a late start? Rep says that they tried, deadline was negotiated, hoped for dec 2018.SB 2076 got in the way, not completed in time. Paddie wants to change his modification to March 2019. Nichols wants to wrap up this study quickly. Earlier the better for session purposes. Dept needs to identify any statutory impediment to a pilot program. He sees no reason this should be delayed at all. 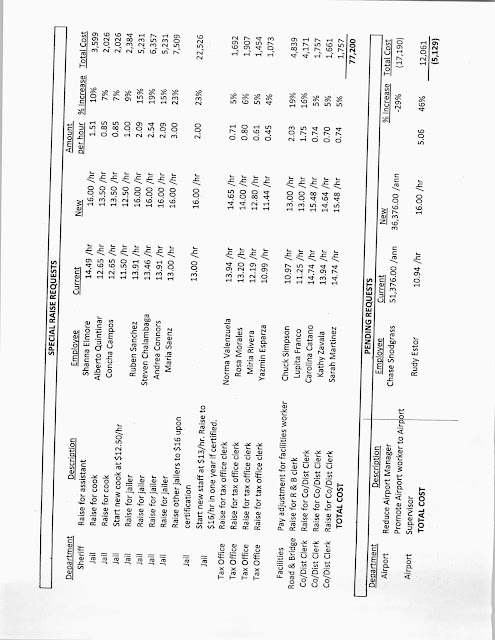 Information needed for session. Paddie says end of March is ok with him. Oversight of salvage vehicle industry. Criminal history of salvage dealers and business partners. 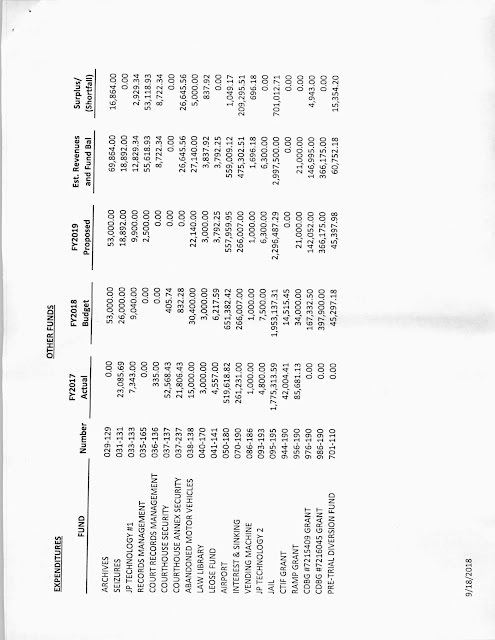 Audits by comptroller of tax assessors. Rolling it into existing audits of tax assessors. Hall has a new modification, previous sentence references it. Watson has a question about giving DMV the ability to audit, not comptroller. Hall says this is for the comptroller, not DMV. 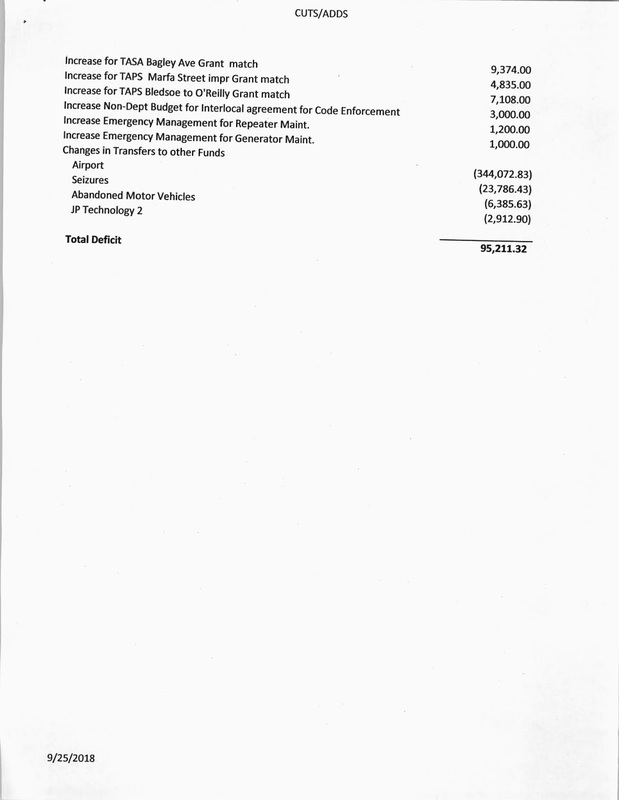 Comptrollers office has looked at this to make it revenue neutral. Watson says it should not be discretionary to determine audit. Why is this not already included in the existing audit? Would analyze processes, not just revenue. Paddie asks about insertion of comptroller issues in DMV sunset. Could this cause a problem later? Director says that it is possible it could add a comptrollers statue in the bill. Not a problem, necessarily. Says sometimes that could open up the possibility for extra amendments. Paddie has this is his objection. Chair would like to accomplish the same goal without taking on the risk. Director says that if direction was given for DMV to have a duty to consult with comptroller on this. Director wants to know if the issue should be pulled or worked out now. Chair says committee will stand at ease for twelve minutes and get language together. Close inefficient offices. 11/1 does not pass. Nevarez brings up Presidio as examples of a lesser used office not necessarily inefficiency. He brings up mega centers in urban areas to be overkill. Small rural offices are not overkill. Sen Hall: agrees with Nevarez. Brings up that when the State requires the public to do something we must not make it difficult to do. He had a closure of an office in his district with some flimsy excuses as to why. Onus is on legislators to have an efficient system. DPS should provide a better service, not less. He found out several offices are only open one or two days per week. He did not know. Offices are not providing the service that is required. Need to be serving people. Rep Flynn agrees with sentiments wholeheartedly. How office has heard from constituents vehemently. Nichols: it’s clear that the definition of inefficient offices is incorrect. Inefficiency is making people drive hours to wait in lines. Call centers also have an issue. Only handling 5000 calls out of 25,000 per day. Chair says that it’s clear that in this case inefficiency to the State is efficient to the citizens. Sunset had the confidence to make recommendations. This works. Four out of five recommendations tend to make it into policy change. Director says that the DPS issues have been very confusing. Lots of misinformation. Sunset commission wanted to protect the rural areas. Offices to be closed were near mega centers, duplication of services. 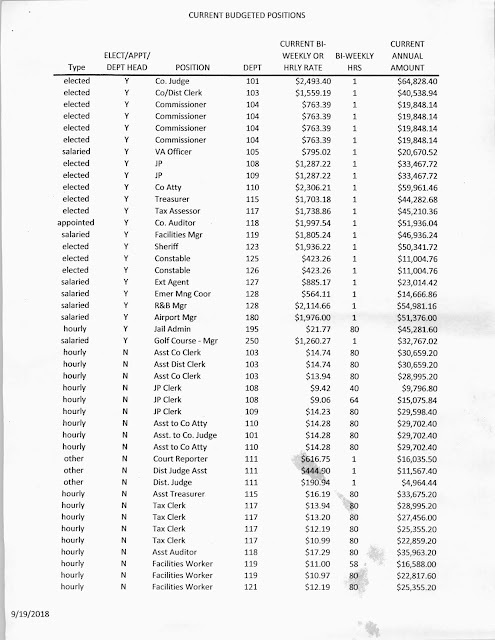 DPS provided their own list of inefficient offices. Chairman says that if the Sunset commission is going to change the structure of the agency, it would not be wise to change operations before the change in operating structure. Flynn says that requiring the public to require things the public needs to be able to do them at their convenience, not ours. Nichols says that the word inefficient was not defined clearly, just referencing for next time. DPS was bringing up rural versus mega centers. Item 1.2 : Birdwell would like to privatize analysis on transferring license issuance to DMV rather than internal inter agency rivalry getting in the way. Watson elaborates on additional modification to modification. Recognition that this system is broken and needs to be fixed. We need funding, otherwise it will be static. Watson wants to ask Lege for funding, hopefully get a bill for transfer in 2021. If no funding, then we move.... Hall would like to move this up, have it happen even faster. This is a needed fix. Watson says this is urgent but it’s bigger then being able to do it quickly. Concern is this is done correctly. Second, third and fourth order of effects are very important. Two legislative sessions needed, says Birdwell. 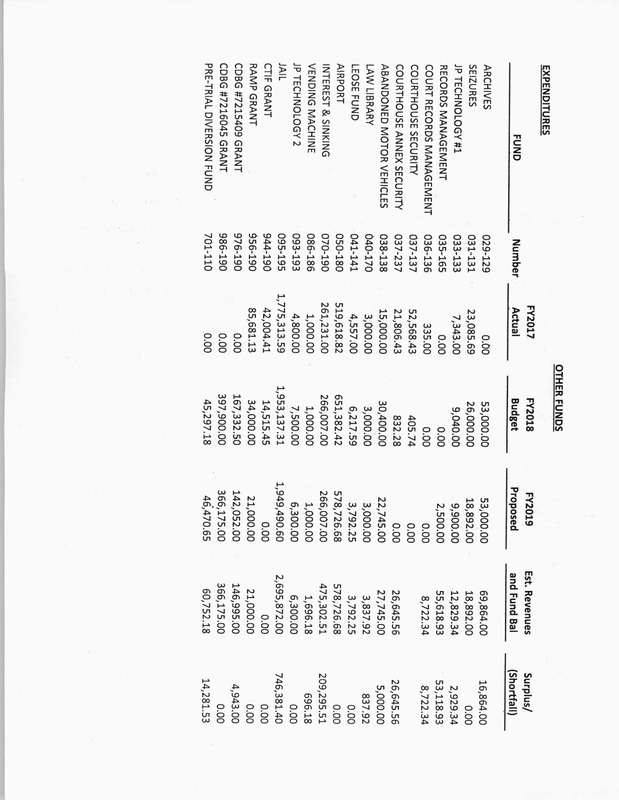 If study is not funded, new modification funds transfer in 2021 session. Move to DMV. Two agencies equal in stature and power will not be able to work this out on their own. Third party necessary. Hall has an objection, says deterioration of service cannot wait five years. Watson says DPS needs to hear how fed up we are, hopes it does not lead to additional inefficiency in agency. If 86th funds recommendation report is done by Sept 1 2020. if not, then process starts and transfer occurs by Sept 1, 2021., after 87th weighs in. What is the likelihood of no funding being approved? Watson says he thinks this will be a priority, but he cannot guarantee. Nichols says this would be a major change in budgeting, we need to be sure we get it right the first time, rather than having to come back to it. Flynn issues objection to issue 2: says DPS has already taken care of it. Nevarez: says that he is concerned bout wording. Mission was outlined two sessions ago. Says crime statistics reporting with regard to what is border security and not border security. Says all crimes are being bootstrapped into border security crimes. Many crimes do not apply. Seems like recommendation is weekly worded in order to quantify success. If we want to do it better, this is not adequate. 2.2 says that DPS was already ordered to do this. Very detailed task was assigned. Wording here is not detailed. Birdwell responds that the process was indeed detailed, this would make the reporting non-discretionary. This is not a change in the requirements. Nevarez says that this is a political issue, if we are going to do this, what are we getting back? Statistics need to reflect the facts of actual border issues, not just regular issues that occur everywhere. Accurate, not co-mingled data. Birdwell understands and says he will call the vote. Thinks Nevarez’s concern is valid, might be best to codify within Legislation. Does not want to consider a last minute modification without time to deliberate it. Nevarez says that he doesn’t think a modification is necessary and that the bill as it was passed four years ago has not generated quantifiable results. Flynn says that he believes that this is all being done well, already being done. Says extra reporting is unnecessary. Flynn and Nevarez vote no, all yes otherwise. Issued 2 adopted. Watson modification to 3.1 adopted. Eliminates some licenses. Options for licensing . Adequate experience is classified as comparable experience to the existing requirements. Nevarez recommendation unnecessary now that earlier adopted. Issue three adopted with modifications.